This second edition for Cambridge O Level Commerce syllabus (7100) is thoroughly updated for first examination from 2018. 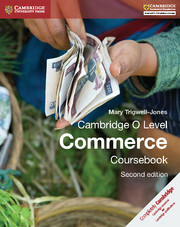 Written by an experienced author in an engaging and accessible style Cambridge O Level Commerce Coursebook (second edition) provides comprehensive coverage of the syllabus and contains lots of activities and practice questions to help students apply commercial theory, with up-to-date, real-life examples.Topics are broken down into the traditional areas within commerce, such as production, retail, international trade and advertising. Units such as the Changing Environment of Commerce examine developing trends and evolving areas of the industry like ecommerce. Written by an experienced examiner to assure teachers that the syllabus is comprehensively covered. Practice questions to provide opportunities to test students' knowledge and progress and engage them in tasks individually or in groups. Exam-style questions to help students prepare for assessment, including model answers. Lots of real-life examples of commercial activity to help set the course in context for students.